The rigid cone structure based on either aluminium or cone fiber eliminates the need for a dust-cap and helps ensure a piston-like behaviour of the woofer. The DALI SUB P-10 DSS is designed with the goal to set standards for subwoofer performance and experience in your listening room or dedicated home theater. Unlike many subwoofers in the market the DALI SUB P-10 DSS has been engineered to perform equally well with both music and movies. 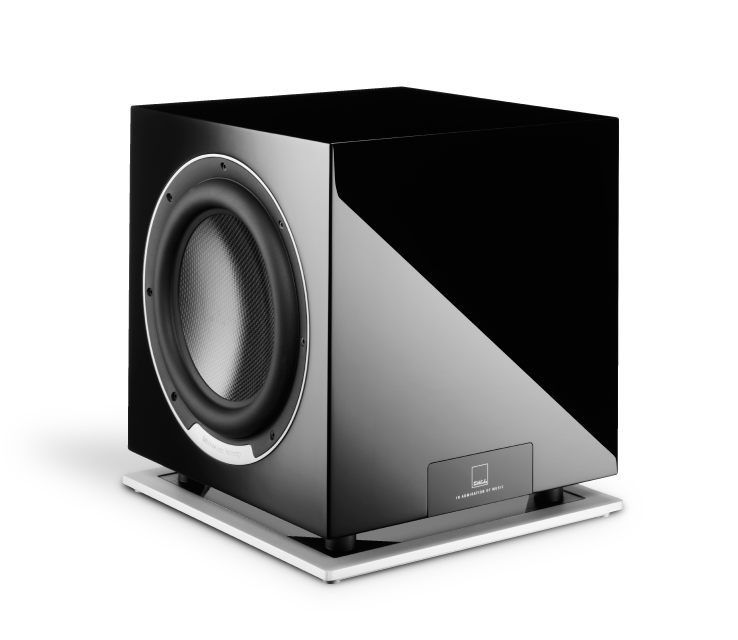 It is important to us that a subwoofer is capable of rendering a performance true to the input signal. Therefore a DALI subwoofer is everything but a ‘boombox’. 3 x 10 inch long stroke design woofers featuring rigid carbon fiber cones, dual spider, low loss suspension, and massive magnet system are fitted into an elegantly styled, compact enclosure and combined with a powerful digital amplifier with a dynamic output of 500W RMS. DALI SUB P-10 DSS features a solid, down-firing woofer, able to move lots of air. The P-10 DSS remote controlled subwoofer, with individual settings and memory for stereo and theater, will be the competent upgrade to high-end stereo and home theater systems. DALI recommends applying the subwoofer with e.g. EPICON, RUBICON and FAZON F5 systems. 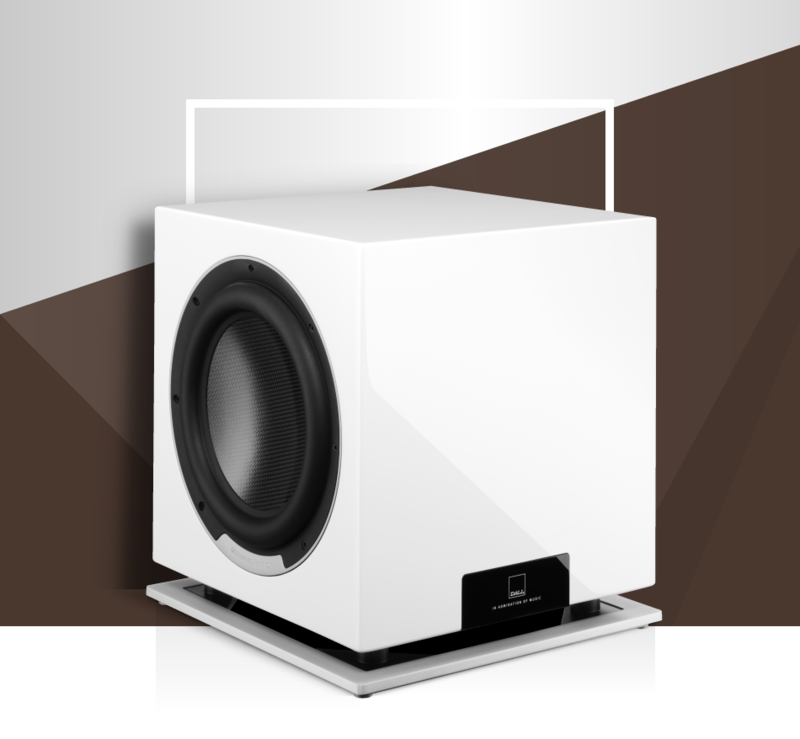 APPLICATION But also customers with speakers from other brands will surely find what they need in this subwoofer. 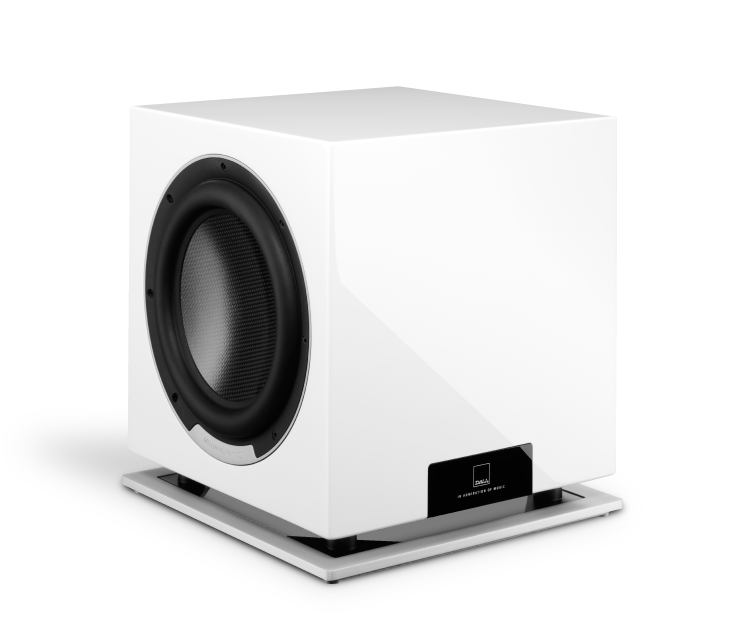 The design, technology, and construction of this subwoofer make it a perfect upgrade of any mid to high end loudspeaker system. 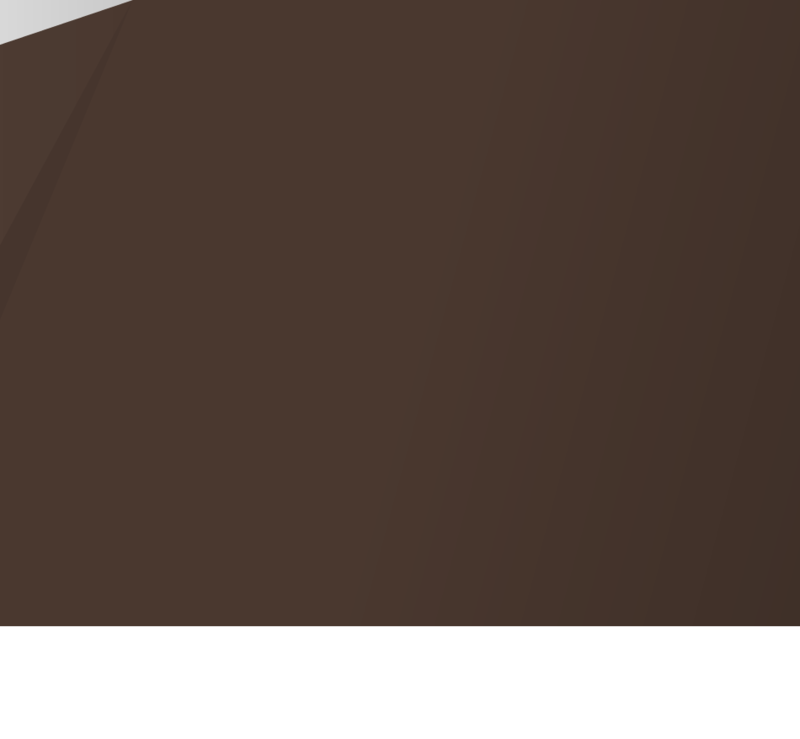 More details are available in the Whitepaper. Fitted with controls for gain, cut-off frequency, and phase, the DALI SUB P-10 DSS will adapt to any front speaker and room acoustics. And with a choice of LFE and LINE inputs it can be connected to almost any amplifier, receiver or processor. DALI SUB P-10 DSS allows you to choose between movie and a music mode, also via the remote control. For a realistic and powerful rendering of e.g. explosions in a movie, the sound mode should be set to CINEMA, amplifying the lowest frequencies to ensure a realistic experience. For a neutral and very linear performance, the sound mode should be set to HIFI. This will ensure a precise rendering of all the details of the music, while optimizing the integration with your front speakers. DALI SUB P-10 DSS is equipped with an active 10” down-firing woofer. The cone is a sandwich construction with carbon fibre at the front paired with paper pulp at the back. The geometry and the material applied eliminate the need for a dust cap. The result is a rigid cone with superior breakup characteristics while at the same time being very lightweight and agile. Indeed these are prerequisites for a precise bass reproduction, rendering all the dynamics of the signal. The two side-mounted woofers share much of the technology from the active driver. Cone geometry is identical to the down-firing woofer, and the cone material is also carbon fibre. The ‘upper’ part of the chassis is the same – 10 legs and identical suspension. However, there is only one spider, and of course no voice coil or magnet system behind it. None of this is due to the visual appearance, however. The whole purpose of the passive radiator is to follow the movements of the active woofer. Though it looks simpler than the active woofer the passive radiator has been through hundreds of hours of careful designing to achieve the exact same tonal balance as in the active version. An example: Embedded in the cone of the passive radiator is just the right amount of zinc alloy to achieve the desired weight. Only with the correct weight and distribution of weight you will get the excursion characteristics you are looking for. Zinc alloy was chosen due to its density and nonmagnetic properties. The SUB P-10 DSS cabinet is designed and constructed from all our knowledge and experience in acoustics, the solid MDF cabinet abides the tough DALI specifications. DALI SUB P-10 DSS features a solid, down-firing woofer, able to move lots of air. To ensure a stable working environment for this woofer the base of the cabinet is made from 25 mm plywood. This guarantees a powerful grip on the driver, eliminating any loss related to the fixation of the woofer itself. "The P-10 DSS reproduces music with the right level of emphasis and power – not too exaggerated, not too ascetic. Whoever would like to play music and/or movies in a relaxed way will truly enjoy this subwoofer." "The SUB P-10 DSS has a crispy precision when it comes to hi-fi as well as a thunderous bass in home theater." "They truly meet the expectations of demanding music lovers as well as the needs of an ambitious owner of a complete home theater."